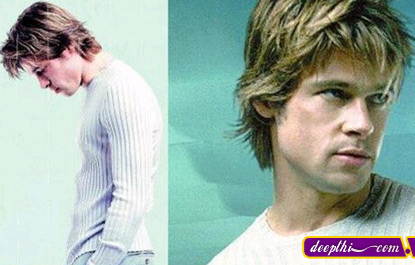 Brad Pitt was born in Oklahoma and raised in Springfield, Missouri. His mother's name is Jane. His father, Bill, worked in management at a trucking firm in Springfield. At Kickapoo High School, Pitt was involved in sports, debating, student government and school musicals. Pitt attended the University of Missouri, where he majored in journalism with a focus on advertising. He occasionally acted in fraternity shows. He left college two credits short of graduating to move to California. Before he became successful at acting, Pitt supported himself by driving strippers in limos, moving refrigerators and dressing as a giant chicken while working for "el Pollo Loco." 1998 - Rembrandt Audience Award - Best Actor - "Seven Years in Tibet"
1997 - Blockbuster Entertainment Award - Favorite Supporting Actor - Science Fiction - "Twelve Monkeys"
1996 - Golden Globe - Best Performance by an Actor in a Supporting Role in a Motion Picture - "Twelve Monkeys"
1996 - MTV Movie Award - Most Desirable Male - "Se7en"
1995 - MTV Movie Award - Best Male Performance - "Interview with the Vampire"
1995 - MTV Movie Award - Most Desirable Male - "Interview with the Vampire"